'Our Piece Of Paradise' is a BEACHFRONT, GROUND FLOOR WALK-OUT with an unobstructed OCEANFRONT view. On a beautiful, quiet, sandy beach that is only 30 steps away. Our beach is reef protected, meaning the waves break offshore. So the ones coming onto the beach are calm. Making our part of the ocean good for swimming, snorkeling, kayaking, paddleboarding, sailing, and fishing. It's especially good for small children. Please notice, we have 2 condos now! If this one is booked, look at listing #3777905, we just bought it a few months ago. We did some other remodeling on this one, too, the last time we were there. We just finished remodeling the bathroom. We took out the tub and replaced it with a beautiful tiled shower. We also took down the popcorn ceiling and replaced it with a nice flower petal design. That along with the new tile floor we put in the bedroom, are some of the minor updates we've put in that don't show up very well in the pictures. We want you to enjoy our vacation home, and come to love it as we do. Our goal is to have you walk in, take one look at the gorgeous ocean view, feel the Trade Winds blowing through, listen to the waves... and immediately relax & let all your stress start melting away. Close your eyes and imagine it now.... doesn't it sound wonderful? We enjoy beautiful sunrises in the morning and moon rises at night. We have seen big Sea Turtles sleeping on the beach in the morning, and Whales spouting and breaching on the ocean(from November to April). We like to sit on the patio and watch the waves break on the reef, sometimes we even sleep on the Murphy bed in the living room just so the waves can lull us to sleep. Then, if we leave the curtains open a little, we can wake up to a gorgeous sunrise streaming in through the lanai window. It is truly our idea of Paradise! Hopefully, it will become yours, too! Many people have told us we have the best location in the building because of our unobstructed ocean view, along with the convenience of being able to just walk right out to the beach. Which you will have practically all to yourself, because there is no public beach access. The pool area is also just for residents, you need a key FOB to enter (which helps to make it safer for kids). You'll be happy to know there is no lock box to mess with. We are one of the few owners who employ an agent to welcome our guests personally. She will show you where everything is, how to use it, and be your on-island contact person while you are here to help with any questions you may have. You will have ''No Worries'' as the locals say...only to decide if you are going to spend the day on the beautiful beach outside your lanai or go for a scenic drive along the coast to do some sightseeing. We have a true 1-bedroom (not the small sleeping alcove some call a bedroom). We also have lots of dresser, closet, and cabinet space, so you will be able to empty your suitcases and make yourself at home. We know some of you like to fall asleep listening to the TV, so we have one in the bedroom and one in the living room. We have tried to stock our vacation home with all the things we enjoy when we are traveling. In fact, we've just added some things from reading our guests comments about some things they thought would be nice to have, that we didn't think of before. One of my favorite things is the Murphy Bed. You will have the choice to sleep in the bedroom on the king size Sealy Plush bed, or in the front room listening to the waves and waking up to see the Sunrise from the queen size Serta Euro-Top Murphy Bed. When we remodeled, we purchased new SS appliances, cabinets, counter tops, rattan furniture, linens, dishes & silverware, cookware, beach towels & mats, beach chairs, snorkel gear, boogie boards, 2 coolers, 2 lounging chairs, binoculars, and much more. There is almost always a nice breeze blowing thru the condo due to the trade winds, but for those who like a fan...we have 2 ceiling fans with remotes and a pedestal fan. We have a big assortment of books & DVDs for all ages. We have also prepared a binder showing nearby grocery stores, churches, restaurants, and doctor; along with sightseeing tips, coupon books, and shopping suggestions. We purchased ''Our Piece Of Paradise'' in 2011 and spent 2 months remodeling it. The kitchen was the most time consuming, but it was worth it because it was a labor of love. We've hired the best cleaning person in the building so our guests can be assured the condo will be freshly cleaned and ready for you to enjoy. For those of you who like some added piece of mind, there is a security guard on duty from 8pm-6am Monday thru Friday and all day on Saturday and Sunday. toilet, shower, outdoor shower, Just remodeled with beautiful, new tiled shower. 2 Flat screen HD TV's. One in the living room and one in the bedroom. The bedroom one is a LED Smart TV. We have tried to stock 'Our Piece Of Paradise' with everything that we have appreciated while on vacation ourselves in the past. We have beach chairs, towels & mats, at least 3 boogie boards, 4 snorkels & masks, and 2 pair of swim fins. There is also a pair of binoculars, 2 coolers, a hair dryer, clock radio, iron and ironing board. Our bathroom has a tub & shower for those who like both. There is almost always a nice breeze blowing thru the condo due to the trade winds, but for those who like a fan...we have 2 ceiling fans with remotes and a pedestal fan. We have a big assortment of books & DVD's for all ages. We have also prepared a binder showing nearby grocery stores, churches, restaurants, gear rental info, sightseeing tips, and shopping suggestions. The complex also has a fitness room for those who like to keep in shape while on vacation. There is also a security guard on duty from 8pm-6am Monday thru Friday and all day Saturday & Sunday, for those who like added piece of mind. 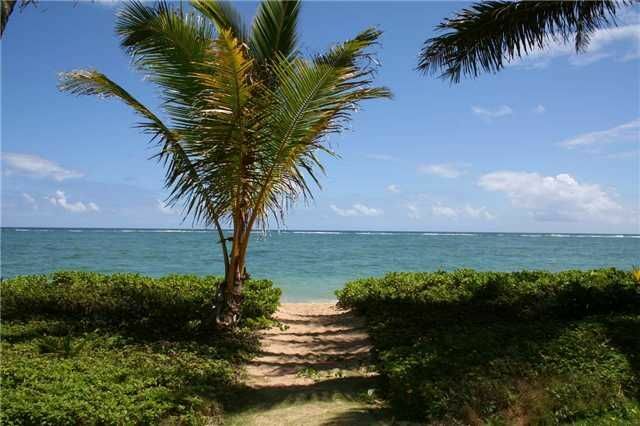 Great location with fantastic walk out & ocean view! Very clean with everything you need to make your stay perfect. Many thanks to Chris & Al for offering such a well equipped place on the water with a spectacular view! Absolutely fantastic. Owners were great and bent over backwards to help. Condo was fantastic. Like being at home but better. It had everything we needed. Al and Chris were fantastic. Surfing, or relaxing in the condo. We had a wonderful time and we will be back every year. Thank you Chris and Al. A mixed bag would be how I would describe this property. On the one hand the plus side is that you are literally at the beach. And it is a nice walkable beach which isn’t always easy to find on the islands. The unit itself is clean. The owners are honorable and responsive. Things work. And the view is wonderful. On the other hand, know that you will be going to a large, 8 story apartment like building. You will be on the ground floor. While that can be a good thing, the problem is that you are located in the hub of all the activity of whomever is staying at this large complex. Some people who will be there will be people renting for the week like we were. You will have some people there who live there full time. But the mail is right by the bedroom where you sleep. So is the trash bin. For those who need key access it will be about fifteen feet away from where you are trying to sleep. And with no air conditioning (which you don’t necessarily need) you will have to have your windows open. Unless you are a real sound sleeper you will be awakened. Now there are options. The living room has a Murphy bed. It’s actually a very comfortable bed. And that room affords quiet.I am a sound sleeper. My wife is not. So we didn’t get to sleep together for the week which is kind of a drag. Yes, we could have both slept together on the Murphy bed, but for us it was a bit too small for both of us. But I am thankful that there was the option of that Murphy bed. So again to reiterate it, it was a mixed bag. I would not want this review to be interpreted as “stay away”. I only mean to give you a full picture of where you are going. We are located on the North Shore, away from all the Honolulu traffic and congestion, but still just a beautiful 45 minute drive (thru the mountains and along the coastline) from the airport. We are centrally located for many of the popular tourist attractions. We're 10 minutes from the Polynesian Cultural Center, BYU campus, Laie Temple, and Kualoa Ranch; 15 minutes from Turtle Bay Golf Course; 20 minutes from the popular surfing beaches and Waimea Valley; 25 minutes from Kaneohe Bay and the Marine Corps Base; and 30 minutes from Kailua and Haleiwa. We would love to help you make wonderful memories of your visit to Paradise! Just like one of our favorite sayings, 'What happens in Hawaii ............ stays with you forever'!! You get your 3rd person's stay for free with stays over a week. Plus additional discounts for stays longer than 10 days. Discounts for Back-To-Back stays, arriving and/or departing the same day as another guest. We have a minimum stay of 4 (or 5) nights unless you're looking for a shorter stay that fits perfectly between two longer stays. Special Last Minute Rate for openings within a month of your stay. We also offer a Military Discount for active duty personnel. Extra $25 cleaning fee for parties of 5. Your reservation will be confirmed when we receive your deposit payment & rental contract Hawaii Tax ID#: W54050685-01 On Island Agent to meet & greet you- Kathe CooperAdditional discounts on stays longer than 10 days.